Set of two occlusive (closed) chest seals for use on (sucking) chest injuries. Works in all circumstances and also on wet or bloodied body. 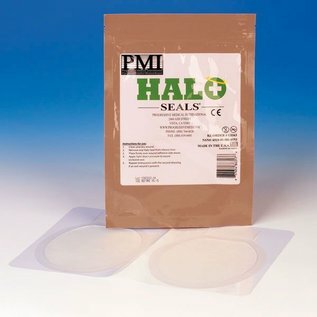 The PMI Halo Chest Seal is designed to work on a patient 'with heavy perspiration or very wet environments. 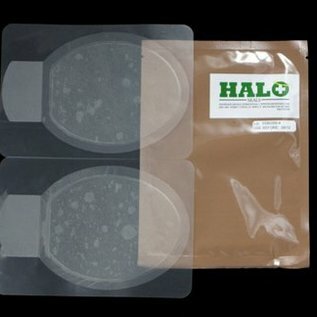 The highly aggressive tack adhesive of the hydrogel will enable the dressing to conform and hold to the patient's body. 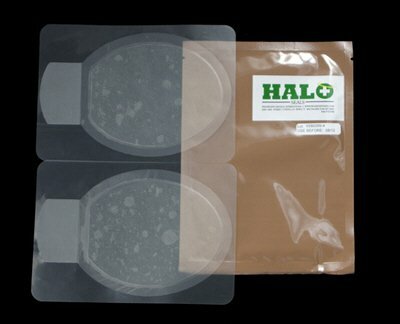 The Halo Seal meets ALL the criteria for the TCCC Preferred Features for Chest Seals. The PMI HALO Chest Seal HAS BEEN tested and designed to perform under extreme conditions. Temperature ranges below 32 ° F to 140 ° F.